There are thousands of stories to be told about Charleston, South Carolina. From the horrors of the slave trade to the city’s rise as a culinary center, from the depredations of Blackbeard the pirate to the city’s long tradition as a home for the armed forces, the city’s history can be viewed from a nearly infinite number of perspectives. If you took 100 tours of Charleston from 100 different people, each one might be meaningfully, even radically different. But before someone can give you that tour of Charleston, they first must obtain the city’s approval. Charleston law makes it illegal to tell stories to tour groups without first passing two different examinations covering the things about the city government officials think are important—or, in some cases, actually getting the government to approve your script in advance. People who talk to paying tour groups without the city’s approval face fines and even jail time. This violates the First Amendment. Tour guides are storytellers, and the government cannot be in the business of deciding what stories are important or who is allowed to tell them. That is why on January 28, 2016, three would-be Charleston tour guides joined forces with the Institute for Justice to file a federal lawsuit against the city’s tour-guide licensing scheme. The suit seeks to vindicate a basic principle: that the First Amendment protects the right to talk for a living, whether you are a stand-up comedian or a journalist or a tour guide. On August 3, 2018 a U.S. District Court struck down the licensing requirement as a violation of the First Amendment following a weeklong bench trial. Charleston has asked the judge to reconsider his ruling and may appeal the decision, but for now, citizens, rather than city officials, are back in charge of what they say and who they listen to. Charleston’s city code makes it illegal to act as a tour guide for hire without first obtaining either a permanent or temporary tour-guide license.1 The process to get either is strikingly onerous. To get a permanent tour-guide license, a would-be guide must pass two different examinations. First, the city requires a written exam, which consists of 200 multiple-choice, matching, and true/false questions administered over the course of two hours.2 The exam questions themselves are drawn from the city’s “Tour Guide Training Manual”—a 490-page book that would-be guides are admonished to study in its entirety and that covers everything from architecture to colonial history to celebrity trivia.3 If an applicant achieves a score of 80 percent or higher on the written exam, they then must pass an oral exam, in which city officials grade them on their verbal descriptions and storytelling about randomly selected sites around Charleston.4 Only then, after proving their ability to both write and talk about the huge array of things Charleston officials deem important, can would-be tour guides tell the stories they want to tell. 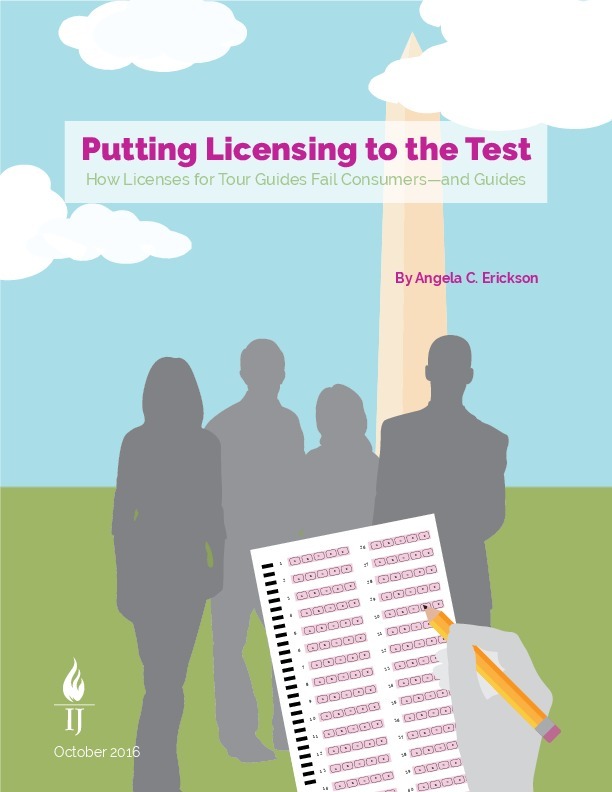 But because the written and oral exams are only administered four times a year, Charleston’s law also allows would-be guides to obtain a temporary tour-guide license while they wait for the next licensing exam.5 Temporary tour guide licenses are only available to people who are sponsored by an existing company.6 The city requires a separate written exam for the temporary license, and the city code also requires that the sponsoring employer provide it with a copy of the script the new guide plans to use, so it can be “approved for accuracy.”7 In other words, Charleston will let you be a tour guide without passing the permanent guide test—but only if it gets to approve what you say. Charleston’s tour-guide license is being challenged by three would-be Charleston guides, all of whom have a deep passion for storytelling but all of whom have been shut out after failing to achieve an 80 percent on the November 2015 licensing exam. Kim moved to Charleston with her husband and daughter in 2014 and quickly started putting together the pieces of a tour-guide business. Kim has many fond childhood memories of Charleston because of her deep family roots there. She turned her lifelong passion for history into a fun tourism business called Charleston Belle Tours, where Kim could give in-character tours of the major sites in the city in full period regalia. She spent countless hours studying for the tour-guide exam, poring over hundreds upon hundreds of flashcards and acing an online practice exam she found on her own. But when she went to sit for the exam in November, she was faced with an endless series of trivial questions that looked nothing like what she studied— including a question about the lead singer of 90s band Hootie and the Blowfish. Kim knew she did not pass the exam and left the exam room in tears. She was right and now has a stack of business cards, a credit-card-processing account and a replica period outfit all ready to go. She has, in fact, everything she needs to run her business—except the government’s permission to talk. Mike spends many hours working as an unpaid volunteer at a local museum in Charleston’s historic district. Mike’s gregariousness and love of Charleston paid off when he was offered a job by a local tour company leading ghost and pub tours in the evenings. The only obstacle? Charleston’s tour-guide exam. Mike, an insurance broker by trade who passed his Series 7 certification examination8 on his first try, is no slouch as a test-taker. He took the test extremely seriously, reviewing the city’s manual in-depth and writing out historical facts and figures on a big board in his office. Mike took the exam in August 15, and despite all this effort, he scored a 73 percent and was forced to turn down his job offer. He redoubled his efforts and took the exam again in November 2015—this time scoring a 67 percent Fed up with the city’s endless series of trivial questions that had nothing to do with the ghost and pub tours he wants to lead, Mike is standing up for his First Amendment right to talk to paying customers without first getting the government’s permission. There is no tour-guide exception to the First Amendment. Charleston’s law violates the U.S. Constitution. The freedom of speech protects everyone’s right to talk to a willing audience about whatever topic they choose without first getting the government’s permission—that is true for tour guides as it is journalists and comedians. The government cannot attempt to protect the public from bad ideas or information, but that is exactly what Charleston is attempting to do. The city’s official tour-guide training manual is explicit on this point. The idea behind tour-guide licensing is “to provide accurate, factual, and updated information to its visitors and residents.” But if Charleston wants to get out a particular message about its history, it must hire its own tour guides. It cannot silence private citizens instead. Charleston has no business protecting its citizens from bad tour guides any more than it does protecting them from bad stand-up comedians. In each case, your best defense is the same: don’t listen to them. Moreover, there is no reason to believe that forcing tour guides to take a standardized test before they talk does anything to improve the quality of the tour-guide experience. After all, there are thousands of stories about Charleston and it is impossible to boil them all down into one 200-question test. A test that is relevant to a tour about colonial history might not be helpful for a ghost tour or a pub tour or a slavery tour. In short, Charleston’s tour-guide law imposes huge burdens on people who want to talk about the city, and it does so for no good reason. If the First Amendment means anything, it means that we rely on people to decide who they want to listen to rather than relying on the government to decide who will get to speak. Charleston’s law gets that important principle exactly backwards, and that is why it must be struck down. These licensing requirements impose serious costs on people who want to get into a regulated business, with many of those costs falling on people in low- or medium-wage jobs.12 For tour guides, as for countless other occupations that pose no threat to public health or safety, it is past time for government to simply get out of the way. Charleston tour guides’ fight for their First Amendment rights comes as academics and even federal judges are in open disagreement how much protection the First Amendment gives to occupational speech—that is, how much protection it gives to people who talk for a living.13 This dispute over the constitutional conflict between the states’ power to license occupations and individuals’ right to speak without a license will inevitably need to be resolved by the Supreme Court of the United States. And much of that conflict is specifically about tour guides. In 2014, the U.S. Court of Appeals for the D.C. Circuit, in a case also brought by IJ, struck down similar tour guide licensing laws in the District of Columbia on the ground that they violate the First Amendment.14 Among other things, that court relied on the fact that “scores” of cities have “determined licensing tour guides is not necessary,” on the “puzzling” application of licensing requirements to “specialty tour guides” such as “ghost, food or movie tours,” and on the conclusion that “market forces” and “consumer review websites” are more than adequate to protect consumers against the risk of bad tour guides—all things that are equally true in Charleston. But in reaching that conclusion, the D.C. Circuit explicitly rejected an earlier decision in another IJ case from the 5th U.S. Circuit Court of Appeals, which had upheld New Orleans’s similar law with minimal discussion of the First Amendment.15 The D.C. court found that the 5th Circuit had failed to address significant legal issues and refused to follow its decision, creating a split of authority between the federal courts of appeal and teeing up this issue for eventual review by the U.S. Supreme Court. The plaintiffs in this case are represented by Institute for Justice Attorney Arif Panju and IJ Senior Attorney Robert McNamara.